21 April 2017 will be a day of major significance for the Romanian Orthodox Church. Five of the bells of the Romanian People’s Salvation Cathedral will be cast at the Grassmayr Bell Foundry in Innsbruck, Austria. According to engineer Corneliu Revencu, representative of Grassmayr Bellfoundry in Romania, the five bells of the National Cathedral will weigh as follows: 3,400 kg, 1,800 kg, 1,000 kg, 750 kg, and 500 kg. The first of the six bells of the Romanian People’s Salvation Cathedral was cast on 11 November 2016 weighing 25 tonnes. 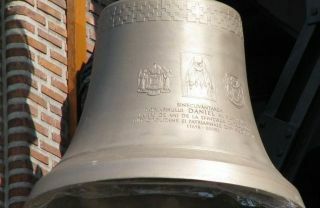 Measuring 3.3 meters high and 3.3 meters wide, the bell moulded on November 11 is the largest of the six bells of the National Cathedral in Bucharest. The bells created by the Grassmayr Bell Foundry have a 15-year warranty and a lifetime of over 400 years.